Berrington Court doesn’t just provide apartments, it provides facilities to enhance your life all on your doorstep. 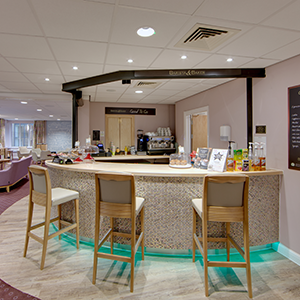 The restaurant and café bar offers delicious food and beverages made with fresh ingredients and served throughout the day in the bright and comfortable restaurant and communal lounge area. Whether you are popping in for a sandwich, enjoying a coffee with friends and neighbours or treating yourself to a hot cooked meal, there’s a great range available to suit all tastes and diets at affordable prices. If pampering and looking your best is your thing, our professional hair and beauty salon is just for you. Equipped with the latest equipment, you can be sure to find a wide range of hair services, and beauty and holistic treatments available at competitive prices. The large communal area is extremely versatile and home to numerous activities, including bingo, exercise classes and musical performances. It can also be turned into a cinema room for those who like to watch something on the big screen. At Berrington Court, there really is something for everyone.